Lee was in the 6th grade when he could not read. Using the book Read Instantly, Lee learned to read in a week! Lee proved he did NOT have learning disabilities. In 1999, Lee Ray Nachman was in the sixth grade, and according to his school records, he read at a first-grade level (level 1.6). Lee’s school was Lassen View Union Elementary School in Red Bluff, CA (http://www.lassenview.org/). His teacher’s name was Mr. Woods. Lee’s parents were constantly told that Lee had dyslexia, ADD, and learning disabilities. Please click on the above video to watch Lee read before and after the six days. In just six days, Lee learned to read. Lee’s ADD ended and it was obviously caused by boredom from sitting in class for six years, unable to learn and participate in class activities. Hi my name is Lee Ray I am 12 I lik to do a lot of thangs. I kane ansr the kwashtanse .I have a bruthr thas a brat. He is 5 and has name is Jrme. hnave a sastr she is 14 and hre name is uteu. She liks to bos me a round . But I stul luf tham. My mom is 30 .My stap dad is 34 and he is a mukanak. Luv tham all. The resan I wont to lrn to rede is reding is upotan to me. Reding is upotan bekus if you don’t know hao to rede you wal nafr gat a raund. I dount tak ubaot my rede a lot bekus I gat upsat wan pepol tes me. So I ban wrking hord at it. I thank you for haping me and wonting to halp me lrn to rede. Ilik the saund of your voes. Thak you a lot. I kant wat to see you. I lik you for halping me. I haf nafr mat a prsa lik you.I hop nafr tote to a famas prsan I haf a lot of faling that you wal halp me Ihaf mane thgs to sae to you. I lik you . got luk on the the show. Ples tal your frand thank you thas mans a lot to me. One Week: From August 5 to 11, 1999, Camilia taught Lee in six days what his schools were unable to teach him in six years. Lee was reading and his progress was documented by videotaping before and after the six days. 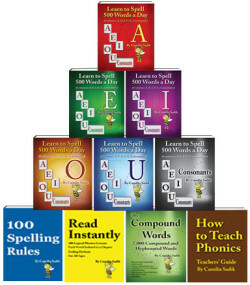 Lee kept learning on his own from the book Learn to Spell 500 Words a Day – The Vowel A and The Vowel E.
Lee’s learning style was simply a logical learning style. Dyslexia: Because Lee learned to read in a week, more than the schools could teach him in six years, he proved he did NOT have learning disabilities nor did he have neurological learning deficiencies. In addition, Lee proved that dyslexia in reading and in spelling could be ended. What Lee needed was someone who could understand his logical learning style. Dyslexic persons need to be informed that they are good thinkers because their learning style is a logical learning style; their brain is wired to accept logic and reject nonsense. Usually, traditional educators can read and memorize the spelling of English words without having to have logical spelling rules. Moreover, they are trained by traditionalists who do not understand the need to make English spelling logical. As a result, they do not understand the needs of a logical learner. Traditional educators, unknowingly, give our children dyslexia before the fourth grade.